In 2012, while vacationing on Martha’s Vineyard, I was shopping for a beach read. 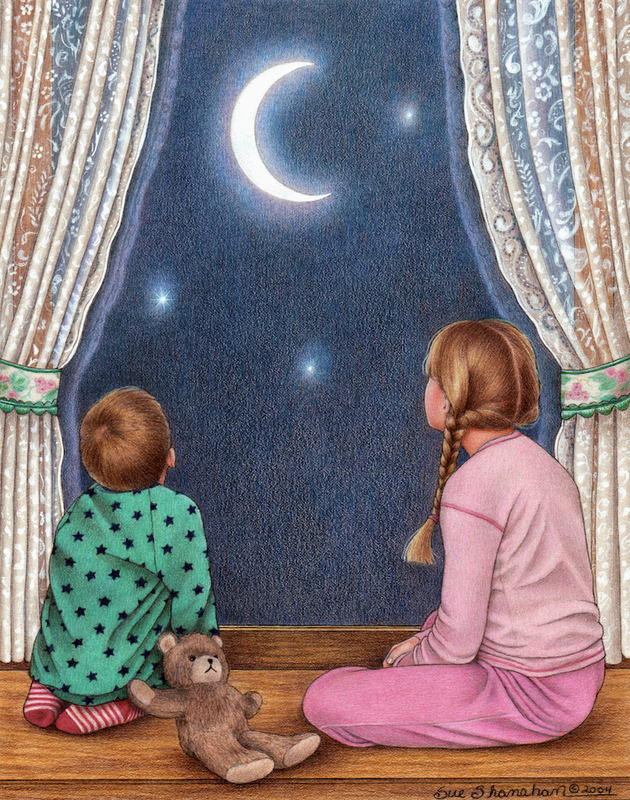 A little volume, whose cover wore the night sky, caught my eye. Its title, When God Winks: How the Power of Coincidence Guides Your Life, intrigued me. Learning the author, SQuire Rushnell, lived on the island and had signed the book was all I needed. I purchased one. I began reading it that evening and finished it long before we trekked to the ocean the next morning. According to the author, a godwink is a message of reassurance that comes from above in the form of a coincidence. It’s a signpost in our life to let us know we’re going in the right direction. I yearned to feel God’s presence and in the pages of this book was a refreshing way to do just that. It’s been said that we model our perception of the Divine by our relationship with our parents. That certainly was true in my case. To me a loving Creator was only wishful thinking. My family was riddled with alcoholism and the mechanism’s formed to cope with it. My father often told me he loved me but looked the other way when it came to my mother’s harsh treatment and verbal abuse. As for my mom, I can honestly say I never heard her utter the words “I love you” my whole childhood. I couldn’t help but grow up with the unconscious belief that although God may be there for others, he ignored me and my prayers. There seemed to be an impenetrable wall between us. Reading When God Winks gave me hope that there is a Higher Power who loves his children (me included) unconditionally. The notion that he puts serendipitous events on our paths to lift our spirits was a lovely concept to me. I liked this way of thinking and immediately began watching for winks. I had no trouble finding them again and again. I’ve come to the awareness that my life has been filled with godwinks all along. I missed them because I didn’t know they were there. When reviewing important events of the past, I can see them glimmering throughout. One such scenario took place in 1994. 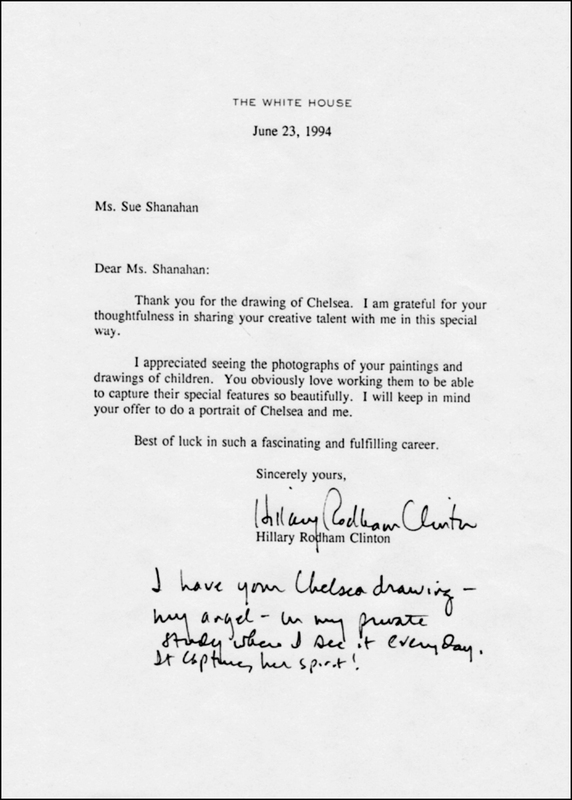 I had a strong inner nudge to draw a portrait of Chelsea Clinton and send it her mother, who was first lady at the time. Mrs. Clinton had been getting such bad press about health care reform, I felt compelled to encourage her. I knew she was partial to angels and wore an angel pin on her shoulder. 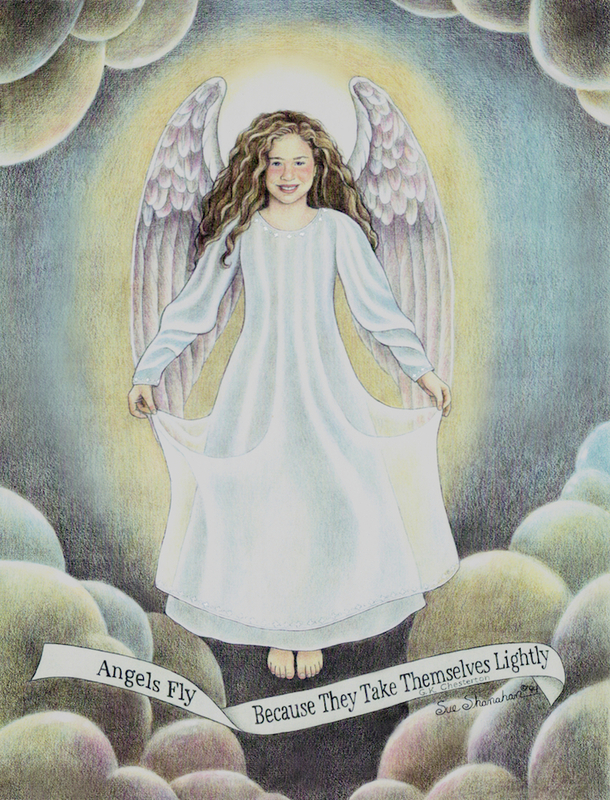 I had the inspiration to paint her daughter as an angel and send it to her. I’m not in the habit of giving my art away, but it was something I felt a strong call to do. For a woman who had little faith in herself, it was a real leap. I didn’t realize it then but I now see that godwinks were there to give me hope and point me in the right direction the whole way through. After I decided to trust my intuition, I came across a wonderful quote to include on the illustration (wink #1). Next, I stumbled upon the perfect photograph of Chelsea’s face to base the portrait on (wink #2). My daughter was close to Chelsea’s age and I was able to photograph her body to work from to create the image (wink #3). I was going to ship the piece to Mrs. Clinton in care of the White House until I stumbled upon the more direct route of sending it to her address at the Eisenhower Executive Office Building (wink #4). When the drawing was completed, I wrapped it up and shipped it off to the First Lady. In less than a week, I received the most lovely thank-you note from her. In it she told me I had captured her daughter’s spirit (wink #5). What a confirmation that I should trust my own instincts! Reflecting back, it seems incredulous that I didn’t notice how miraculously everything had fallen into place. But you can’t perceive what you don’t believe exists. Godwinks is now a household term in my family. Watching for them has made all of our faith bloom and grow. It’s almost a different form of gratitude. Of course, at times, I still slip back into my old thinking patterns. When I pray for assistance, I’m always given a nod from God that lets me know he hasn’t abandoned me. I’ve found the evidence of his love is everywhere if we only shift our focus and look.